Drawing on the experience of OCEAN2012 and Seas at Risk, this post reflects on how civil society organisations (CSO) and non-governmental organisations (NGO) can build strong networks of communication and collaboration for influencing political decisions on environmental conflicts. OCEAN2012 and Seas at Risk are two networks that build on strong alliances among NGO and different civil society actors. Both were formed to influence the outcome of political decisions on fisheries captures and aquaculture (and other marine issues), respectively, at the national and European levels. In evaluating comparatively their level of engagement with diverse actors on different scales (local, regional, national, European, and global), their capacity to develop joint positions and arguments, and their diverse strategies and tools, this post elaborates on what can be learned from their successes and limits for future CSO / NGO networks. I participated in both networks / campaigns while working in ENT Environment and Management / Fundació ENT – a Barcelona-based environmental consultancy and NGO, which was a partner-entity of OCEAN2012 and Seas at Risk. OCEAN2012 was formed in 2009 to influence the reform of the European Union’s Common Fisheries Policy (CFP) for the period 2014-2020. The coalition included 193 groups from 24 member-states and some international ones. These consisted of large and small environmental NGOs, cooperatives of small-scale fishermen, scientists, development agencies, consumer and development organisations, dive centres, restaurants, etc. It was open to any social actors negatively affected by overfishing or worried with the current state of the marine ecosystem and fishing policies. First established in the 1970s, the CFP has systematically failed to ensure the sustainable use of fishing stocks. It is commonly recognised that fishing fleets have become too large, and increasingly unprofitable and reliant on public subsidies, and that this situation has harmed coastal communities and small-scale fishing. How to change this trend and protect stocks was at the centre of the discussions in the European Commission and European Parliament. OCEAN2012 has pushed European legislators to establish stringent regulations to prevent overfishing. In this network, disparate actors discovered common interests, established a strong joint position and, ultimately convinced European parliamentarians to take steps towards ending overfishing. The CFP reform sets a legally binding target to end overfishing where possible by 2015, and totally by 2020. It also includes reducing discards (and by-catches); restoring the fish stock; using transparent (inluding social and environmental) criteria when allocating fishing opportunities; rejecting a proposal for compulsory transferable fishing concessions; and setting an appropriate allocation of funds (e.g. not allowing an increase in fishing intensity or fleet volume). Seas at Risk deals with the development of aquaculture in Europe. It includes many NGOs from different countries and diverse expertise on marine issues, whose aim is to establish a common position about the development model of aquaculture in Europe and related legislations. Aquaculture has grown remarkably throughout the world in the last two decades due to increased demand for seafood and stagnant global catches, but it has stagnated in Europe since the 2000s. While the European Commission and the European Parliament encourage the growth of aquaculture, many NGOs, fisher people, angler societies, local people, and tourism representatives are concerned with the negative social and ecological impacts of such development. The latter actors complain about the increased sedimentation and pollution of sea waters; the use of chemicals and antibiotics that easily spread to wild species; the intrusion of invasive species through escapees; and the diffusion of illnesses. Although the policy-making scene was dominated by public administrations and aquaculture sector representatives, building a strong network enabled Seas at Risk to make NGOs’ voice heard. Members of the SAR network participated in all possible national and European meetings and workshops on policy changes and strategies for aquaculture. There, they shared their opinions, expertise and experience, and used these communications to publish the joint position paper “Priorities for environmentally responsible aquaculture in the EU“. These proposals were presented in the European Commission workshops on the development of a guidance document about the implementation of European aquaculture in line with the WFD (Water Framework Directive) and MSFD (Marine Strategy Framework Directive). Thanks to this joint effort, the network’s position document has become a key reference in the guidance document of the EC and voiced NGOs’ common demands and alternative proposals for aquaculture development in Europe. Unlike OCEAN2012 that included diverse local actors, the SAR is composed only by actors working at the European, national, and regional level. Its activities are focused largely on shaping policy-making by using scientific investigations conducted by NGOs or independent research centers. Both networks managed to discuss and establish a common position. In OCEAN2012, national and European coordination organised meetings and events where members would periodically came together, while the SAR was centered in Brussels and some of its members were only able to participate in some regional workshops. OCEAN 2012 campaign focused mainly on: (i) making direct pressure to the European Parliament, which included the analysis of relevant parliamentarians positions and face-to-face conversations; (ii) elaborating plenty of position papers; and (iii) organizing many public and participative activities with small-scale fisher people, CSOs, NGOs, families and children, etc. In turn, SAR relies mostly on tools such as the publication of common position papers, press releases and reports signed jointly by European NGOs, and participation in discussions and workshops organized by the EC. A good example illustrating the importance of involving civil society actors in lobbying policy-makers is the participation of OCEAN2012 members in the “Paint a Fish” campaign, initially organized by the New Economics Foundation. This allowed to join families and children in protests and festivities in many locations. Activities were organized to raise awareness about fisheries policy and to make more marginalized voices heard. Images of people creating a fish figure, carrying posters of the campaign or fish drawings of children that were taken during these activities were spread through social media. 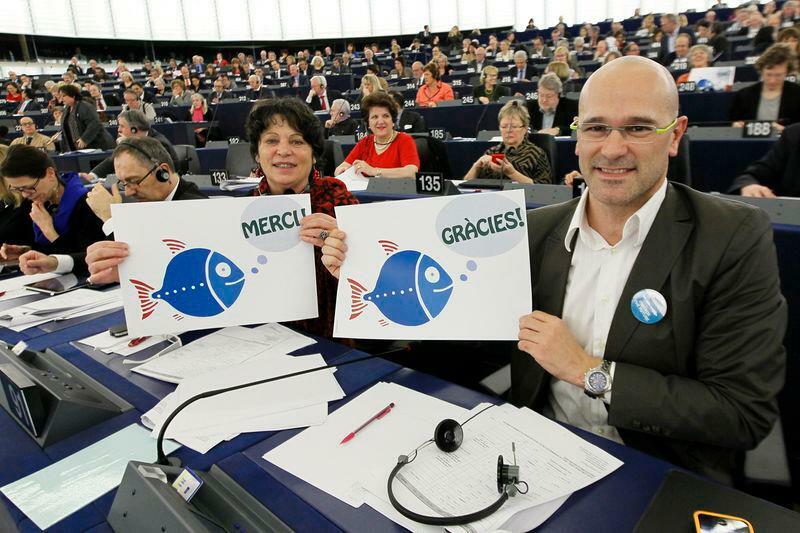 Postcards with children’s fish drawings were sent to the European parliamentarians in order to affect their opinion and votes about the Common Fisheries Policy reform. These postcards had policy messages and were written from a child’s perspective demanding the protection of seas and the survival of fish. 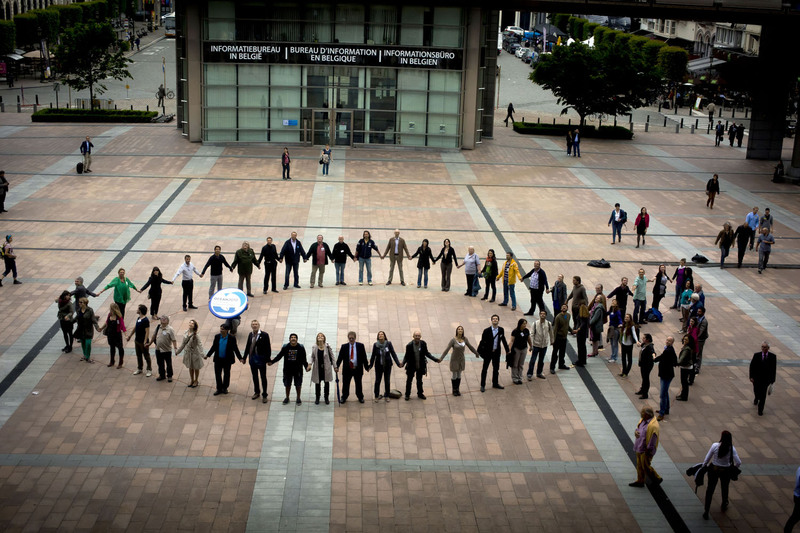 Related activities included forming a kind of human chain in the form of a fish in front of the European Parliament. Politicians and representatives of fisheries and aquaculture sectors attempted to undermine the networks efforts by claiming that they were NIMBY (Not-In-My-Back-Yard) initiatives. However, both networks were successful in demonstrating that conflicts over fisheries and aquaculture are not only about the interests of some people, but regard society at large. Social actors opposing overfishing or aquaculture’s unsustainable development did not focus only on their locality or on the sector; rather they had broader arguments and demands regarding the use of European waters and natural resources. Due to the large number of members involved, both networks also were capable of influencing the outcome of political decisions on these issues, and underlined the importance of participation of local actors in decision-making. The successes of both networks had other common aspects, including good timing and diversity of strategies. They succeeded in agreeing on common demands and positions with fast and collaborative organization and coordination, good communication among members, and repeated meetings where they shared opinions about each step. Although campaigns tend to be mid- or long-term oriented, they became quite successful by increasing the number and intensity of activities just before important European public decisions were made, including votes on the CFP or the publication of guidelines on aquaculture. The use of diverse strategies, ranging from the presentation of scientific data to direct conversations with parliamentarians, from organising massive public festivals and protests to providing alternative solutions, also contributed to their success. Nonetheless, a significant challenge of building large alliances regards the discussion of common positions and proposals. For instance, regarding CFP reform two proposals were discussed: either insisting to abolish tradable fishing permits, or trying to stop new policies making them obligatory. At the end, OCEAN2012 decided for the latter since some countries were already using these permits (which made it more difficult to abolish them completely) and the chances for success of the second option seemed higher. A related challenge is to understand whether working in large networks and aiming to find common ground decreases the potential of protest or silences more radical arguments. The desire to reach consensus may eliminate some alternative proposals of participating groups (such as abolishing tradable fishing permits completely), or some groups may consider to leave the network if they do not agree with the dominant positioning. However, the benefits of establishing a joint position was crucial for the success of both campaigns. It gave legitimacy and strength to networks, and consequently turned them into powerful social actors with capacity to influence policy-making. Alliance-building contributes to situate environmental conflicts in the broader socio-political, economic and ecological context, and makes visible reciprocal connections. Through OCEAN 2012, it was made clear that the decline in fishing stocks is not a problem of a small-scale fishermen in one village, but that overfishing causes intense environmental and social problems. Meanwhile, SAR highlighted that the rise of aquaculture is not a direct solution for decreasing fish stock, but interrelated with the problems of overfishing and ecological problems and opened debates of what kind of an aquaculture development model Europe should pursue. Therefore, strong NGO / CSO networks contribute to underline that environmental conflicts are not limited to locally focused claims of some interest groups; rather they include environmental justice demands for many actors in varying regions. This highlights the importance of developing a joint position and common demands for moving towards more just, participatory and sustainable society-nature relations. Discard is the portion of catch that is thrown overboard, but which may be of important ecological or commercial value. Discard typically consists of “non-target” species or undersized specimens (so that it does not get counted within the allowed quota for captures). By-catch refers to fish and/or other marine life that are incidentally caught while capturing the targeted species. Most of the time bycatch is discarded at sea. A Total Allowable Catch (TAC) is defined for each fishery and divided among the individuals of the fleet according to “historical” fishing records, usually over the past five years, during which the most informed fishers have been “racing for quota,” catching as much as possible and targeting strategic species. With Individual Transferable Quotas (ITQ) or Transferable Fishing Concessions (TFC), individual access rights to a common resource are transformed into a tradable commodity. While the very existence of ITQs and TFCs is already a controversial issue, many actors argued that making them compulsory would enable a total commodification of the sea. The WFD and the MSFD establish the standards in order to have good ecological and chemical conditions of aquatic ecosystems in Europe.